London attacks: How is security organised at other seats of power? 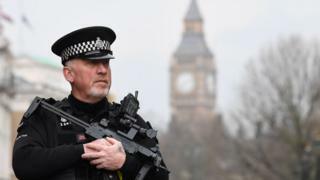 The attack on the British parliament building was stopped quickly, and security forces locked down the area within minutes. But the attacker still managed to enter Westminster and fatally wound an unarmed police officer, before he was shot. Prime Minister Theresa May has said police are now reviewing security, "as is routine". So what is security like in other national parliaments and seats of power, and how do other countries balance safety against accessibility? Berlin's Reichstag has fences in front of the building where the main entrance is, but it is relatively accessible to the public and there are no fences on other sides. Admission to the building's glass dome on the rooftop is free, but you do need to register in advance. There is even a rooftop restaurant - the only parliamentary building in the world with one, it claims - but it requires the names and dates of birth of guests 24 hours in advance, and you must bring your passport or ID with you. Despite its open-plaza appearance, the building is encircled by low concrete blocks. They provide no obstacle to pedestrians, but are a significant impediment to vehicles - and they dot the roadside all around the building, the park, and the German Chancellery nearby. The Reichstag was famously set alight in an arson attack in 1933, for which a young Dutch communist was sentenced to death - something the Nazi party then used to vilify communist opponents, resulting in electoral gains. The Brussels headquarters of the European parliament is part of a large, modern complex - and so is significantly different from the historic buildings used by many countries. It's also decentralised, with many of the plenary sessions taking place in France, and some administration work in Luxembourg. But it's the Brussels headquarters that is most iconic. It is easily accessibly by road or on foot, protected by low steel bollards on the roadside. Access to the buildings themselves requires a national ID card or passport, plus "airport-style security checks", but when parliament is in session, it's possible to slip in as an observer on the day without advance notice. The nearby Maelbeek metro station was one of the targets of the 2016 Brussels attacks - but the EU buildings themselves were untouched. It later emerged that one of the attackers had worked in the European parliament briefly during two summers. The French National Assembly's grand front gates directly face a bridge of the river Seine, offering a straight-line view to the iconic Place de la Concorde. But, like the German Reichstag, concrete bollards set in front of the gates prevent any high-speed ramming from that long straight road. The Senate, meanwhile, meets in the Palais du Luxembourg. While one exterior wall by the roadside is solid stone, the remainder lies among public walkways in a park of the same name. Tourists and locals alike can stroll up to a waist-high gate separating them from the building's many windowed doors - although the area is patrolled by heavily armed police. In contrast, the Elysee Palace, home to the French president, is a fortress of high walls, steel fencing, traffic restrictions, and armed patrols. It lies a short distance from the Champs-Elysees, one of the country's main tourist areas. Groups wishing to visit either the National Assembly or the Senate need the sponsorship of a senator - but because of security measures in effect in France, individual visits are suspended for both. More than 230 people have died in terror attacks in France since January 2015 - but none have targeted the Paris political strongholds. There are two main centres of power in the centre of Washington DC: the Capitol building and the White House. The grounds around the Capitol building are open to pedestrians, but vehicle traffic is cut off by traffic barriers - only allowing those with permission in. The main entrance for visitors to the Capitol building is through a visitors' centre, where security is extremely tight - much like airport security. No liquids, food or pointed objects are allowed. The guards throughout the area and at several important nearby buildings are very well armed. The White House is perhaps a more popular symbol of American power, and has a myriad of myths about its security - thanks in large part to Hollywood films. It is enclosed on all sides by steel railings several feet high, which are in turn encircled by steel bollards and chains. The mansion itself is quite distant from most of the railings, giving Secret Service plenty of time to pick up any fence-jumpers caught by the constant close surveillance - although one man, carrying a knife, made it into the building in 2014. The closest point from a public area to the mansion is on the North Lawn, a well-known viewpoint of the White House exterior. But security there is especially tight, with armed guards, and gatehouses which protect the entry points. And then there's the Secret Service and high-tech defences - including sniper surveillance, radar technology on the rooftop, and, of course, the "bunker" of the emergency operations centre under the building. There is a ring of steel around the Palace of Westminster - but the attacker was able to enter into Parliament's grounds through the gates to New Palace Yard, which is below Big Ben. Can a lorry attack ever be stopped?